My mom's broccoli salad is one of my absolute favorites. But then my Sorority Sister Marie made this salad for our AGM, and it has now replaced it. She found the recipe on pinterest, and with my dad coming over, I decided it would be the great side dish to the selection of wings I was making. And it was. It was delicous! 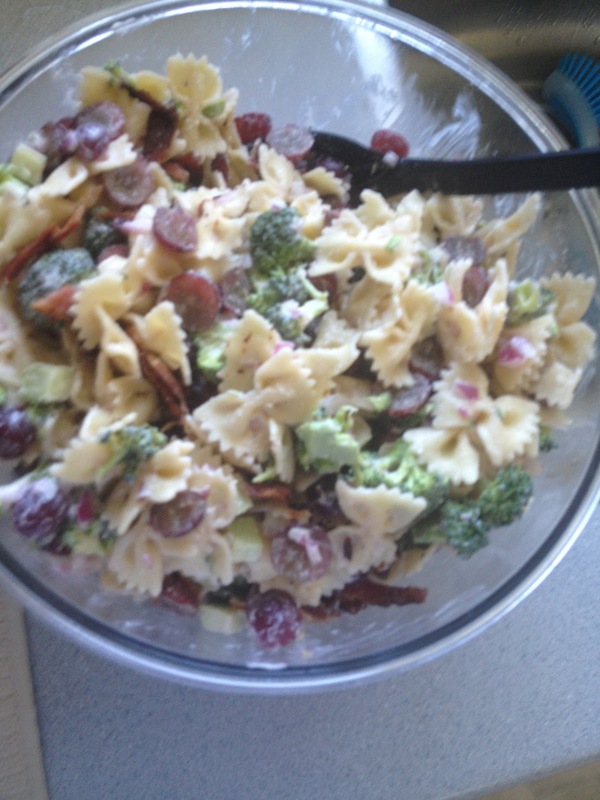 It's a take on the traditional broccoli salad, but with pasta! Bowtie noodles to boot! The recipe can't be found here. I didn't add nuts, but I should have, and I kinda skimped on the broccoli (it was all I had). Next time more broccoli and add the nuts! The salad is made a head so the flavors soak and get all great! So I made it before lunch, and Marie had made it the night before, Just add the bacon/nuts last so they don't get soggy! 1 pound of broccoli --- that's probably about two bunches, I only did one bunch from the grocer. cook pasta till it's still firm, not over soft. Meanwhile, start shredding your broccoli into miniature bite size pieces and chop up the onions. Through it all together with the sliced grapes and the dressing. Cover and refridgerate. Later add the following and serve!